Once upon a time I happened upon a girl named Haley. We became friends and like you do with new acquaintances in life, I began to learn about her. I learned that she was an actress, that she had a really great laugh, and also that she could make a really mean pastrami sandwich. 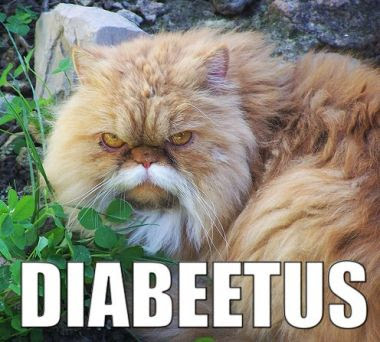 She had an impressive resume that included a degree from the University of Fine Arts in Philadelphia, had recently married the love-of-her life Andy, and was the gentle caretaker to a cat with diabetes named Eva. 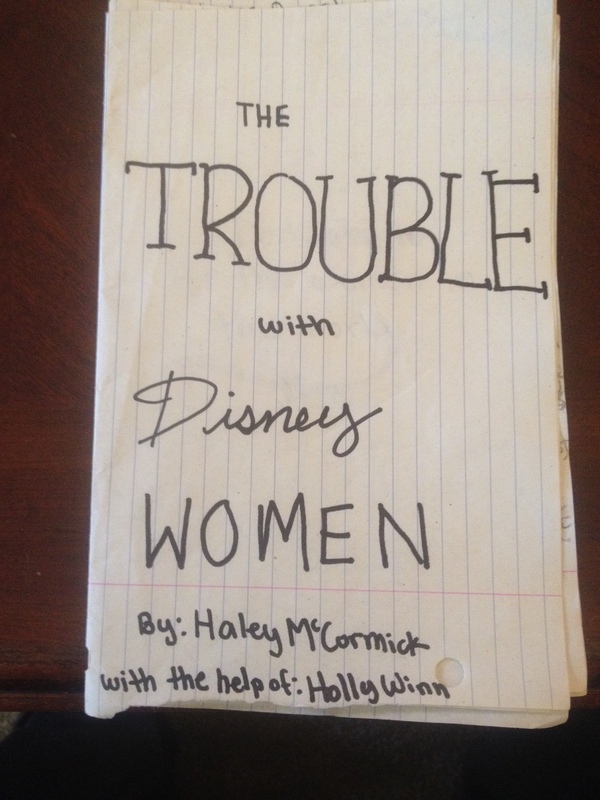 Haley breaks each page down with a handy take-away life lesson and you should pay close attention to all of them, because they are very wise for a pre-pubscent girl who clearly had a lot of time on her hands. 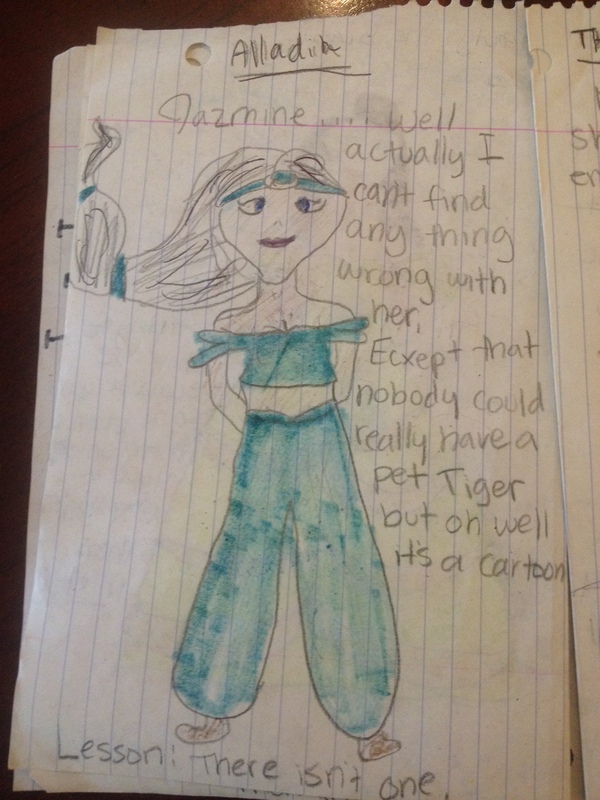 Well color Haley stumped: “…Well I can’t really find anything wrong with her (Jasmine), except that nobody could really have a pet Tiger – but oh well, it’s a cartoon.” The lesson you ask? THERE ISN’T ONE. Foreboding end Haley, well-played. Also, I didn’t know Jasmine had two lazy eyes. As you can see, Nala isn’t technically a woman, but she is female. 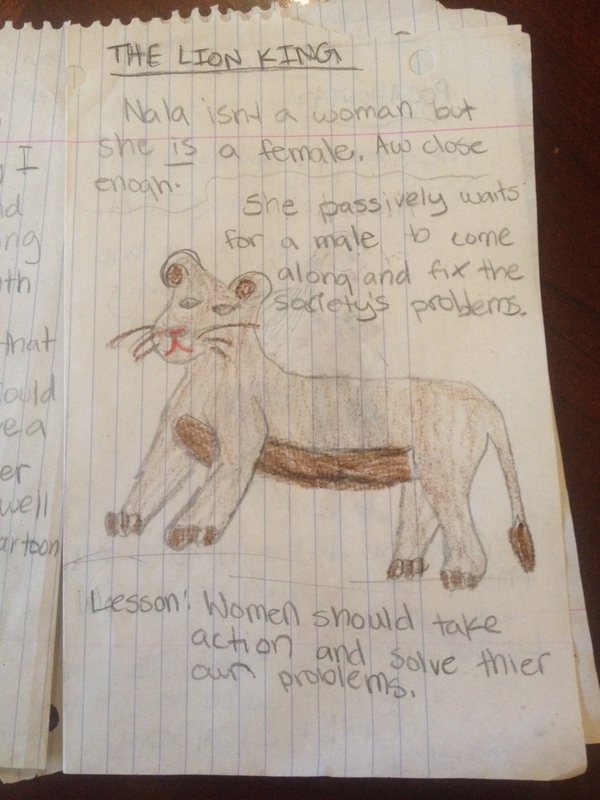 To which sweet Haley proclaims: “Aw, close enough.” However, Nala passively waits for a male to come along and fix society’s problems when really (and here’s your lesson) “Women should take action and solve their own problems.” And she’s right, life isn’t all hakuna matata Nala! And everything the light touches isn’t your kingdom – it’s Simba’s, because he’s a man. Go take a Women’s Studies class or something – geeze! 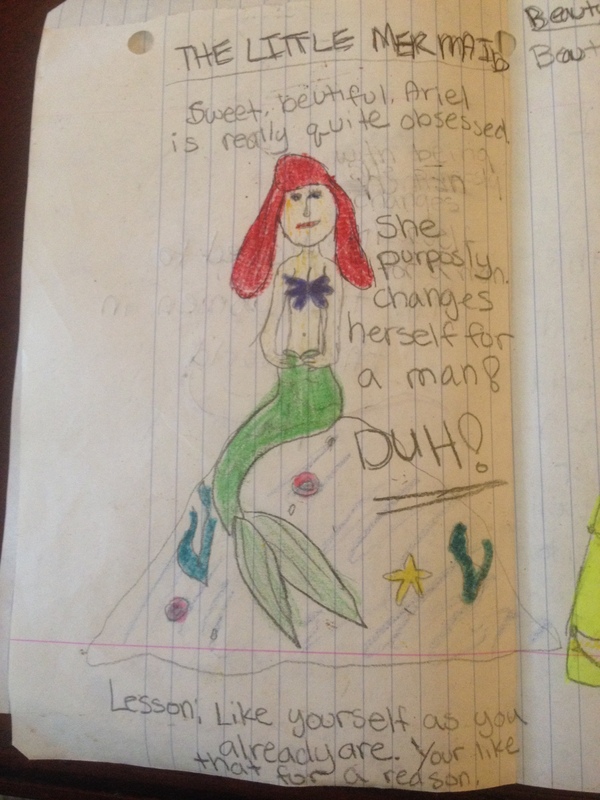 I feel silly that in light of acknowledging Haley’s groundbreaking and culture-shifting writing, that we haven’t acknowledged her attention to detail and effortless illustrations. Certainly it makes sense that a women of the arts would be well-rounded in all trades, but look at this side profile of Meg from ‘Hercules,’ her bangs are extraordinary. 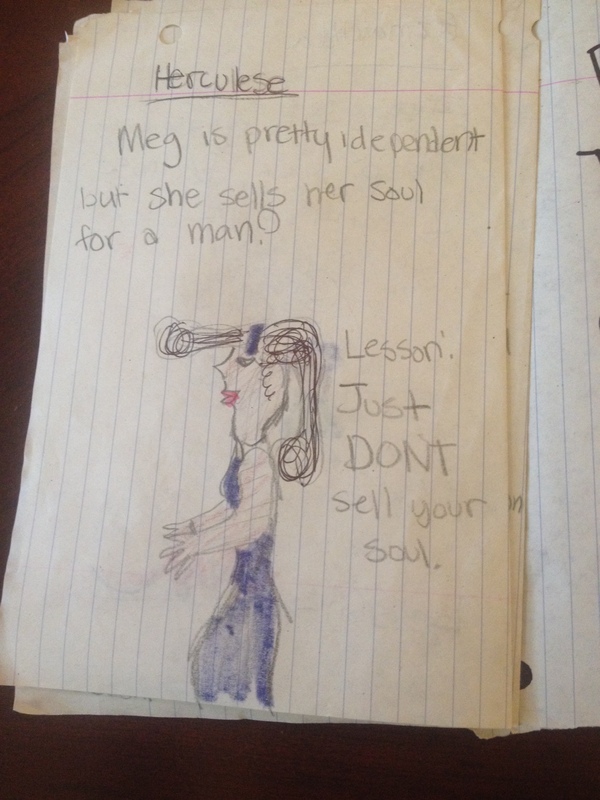 Similar to Jasmine, she couldn’t really find anything wrong with Meg except for the fact that she sold her soul. Simple solution to said problem? “Just DON’T sell your soul.” Duh. I only hope with this being the last page, that it means the sequel: ‘The Problem with Disney Men,’ is currently in the works. 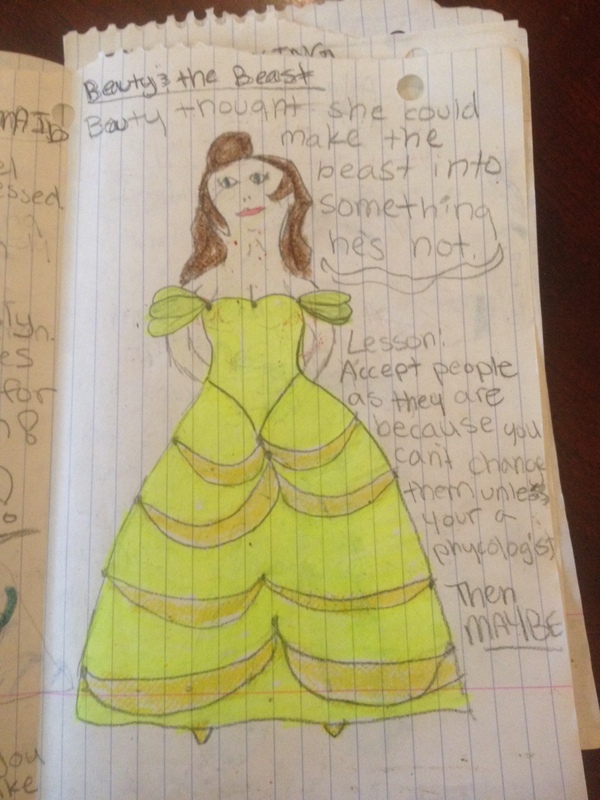 Thank you to my friend for allowing me to share this on my blog, the first time I read it I laughed so hard that beer came out of my nose and I can only hope that happened to at least one other person who happened upon this. Now, go wish upon a star or something. Posted in Uncategorized.Tagged aladdin, ariel, beauty and the beast, belle, disney women, females, feminism, funny, hercules, jasmine, lion king, little mermaid, walt disney. Although I didn’t have beer flowing from my nose I certainly laughed out loud and cherished that sweet little girl who is now such a fine woman!